You might be surprised to learn that one of the foremost male ballet dancers of the twentieth century was a Kay. He was Sidney Francis Patrick Chippendall Healey Kay, known to his family and friends as Pat Kay, but known to the wider public as Sir Anton Dolin. He was largely responsible through his efforts as a dancer and choreographer for the wide appeal that ballet has today. Pat Kay was born on 27th July 1904 at Slinfold near Horsham in Sussex. As a child he loved performing and, encouraged by his mother, took singing, dancing and acting lessons. He first appeared professionally at the age of 12 as Peter the Cat in a Christmas play called ”Bluebell in Fairyland” earning £2 per week. He went on to appear in Peter Pan, playing John, for three years until his voice broke. However, it was dancing that was his first love. In 1917, he saw the great Russian ballerina Seraphina Astafieva dance at the London Coliseum and immediately applied for lessons at her school. 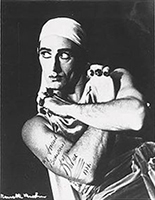 It was whilst he was with Astafieva that he came to the attention of Serge Diaghhilev and in 1921 Pat Kay began his dancing career in the corps de ballet of Diaghilev’s Ballets Russes. 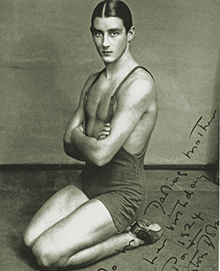 Whilst there he was coached by Bronislava Nijinska, sister of the legendary Vaslav Nijinsky. She encouraged Kay’s special qualities, his natural technical brilliance in fast spins and his dramatic bravura. It was at this time that he adopted a more exotic sounding stage name, Pat Kay became Anton Dolin. He chose the name in order to hoodwink the press into thinking he was a Russian dancer. He was not alone in changing his name; a number of other eminent dancers did the same, Alice Marks became Alicia Markova for example and, more famously, Peggy Hookham became Margot Fonteyn. As a soloist with the Ballets Russes, he created the leading role in Train Bleu (1924) choreographed by Nijinska. In an interview towards the end of his life, Sir Anton claimed that this was his greatest role. Train Bleu was an overnight triumph and brought him fame at the age of 20. The ballet, in which he was dressed in a bathing costume for a story of sport and flirtation on a beach, highlighted his athletic and acrobatic prowess. During the 1930s and early 1940s he danced the leading roles in numerous ballets and his partnership with Alicia Markova was regarded as one of the great partnerships of classical ballet. In 1935, the couple formed their own company, the Markova-Dolin Ballet, which continued until 1938. In 1950, they established the London Festival Ballet. 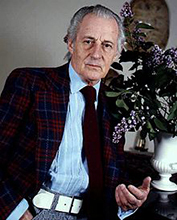 Dolin remained its artistic director and principal dancer until 1961. He then went on to organise and tour with the troupe Stars of the Ballet, worked as choreographer and director of the Rome Opera Ballet, and served as artistic adviser to Les Grands Ballets Canadiens. He was knighted in 1981. Sir Anton Dolin died of a heart attack in Paris on 25th November 1983 whilst on his way to stage a ballet for the Ballet Theatre de Nancy. He was 79 years old. Sidney Francis Patrick Chippendall Healey Kay was the son of Henry George Kay (1852-1922) and Helen Maude Chippendall Healey (1869-1960). His grandfather was James Openshaw Kay (1805-1857) who was from Bury and was from that distinguished line of Kays that originated at Bass Lane, Walmersley. The Bass Lane Kays were near neighbours of the Kays of Park, one of whom was John Kay (b. 1704) the inventor of the Flying Shuttle. Although the Bass Lane Kays claimed kinship with the Kays of Park we do not know quite how the two lines were related. Sir James Phillips Kay (1804-1877) was also of the Bass Lane line. There are clips of Anton Dolin dancing on YouTube and the BBC website has a recording of his appearance on Desert Island Discs from 1982.